I really have no special thing to say for this entry. 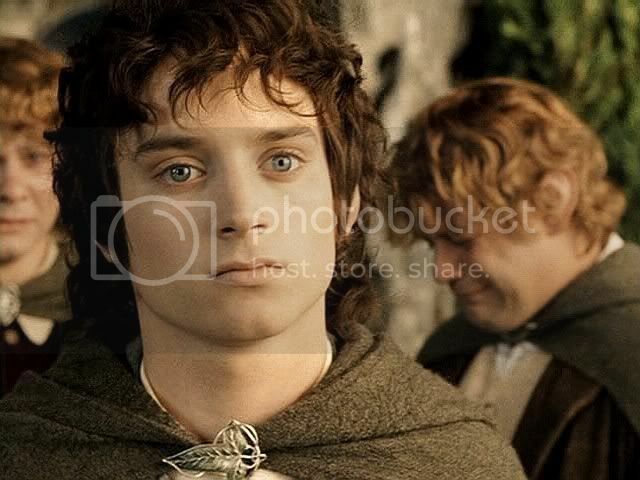 I merely wanted to present this long narrative poem by jan-u-wine I read a few weeks ago that I thought made a fine “Summa” of Frodo’s life from his perspective. It opens with Frodo home from the Quest. The "Year of Great Plenty" has passed; golden-haired children such as the Shire has never seen have come into the world. It's autumn, the time of the turning of the year and the taking of journeys. 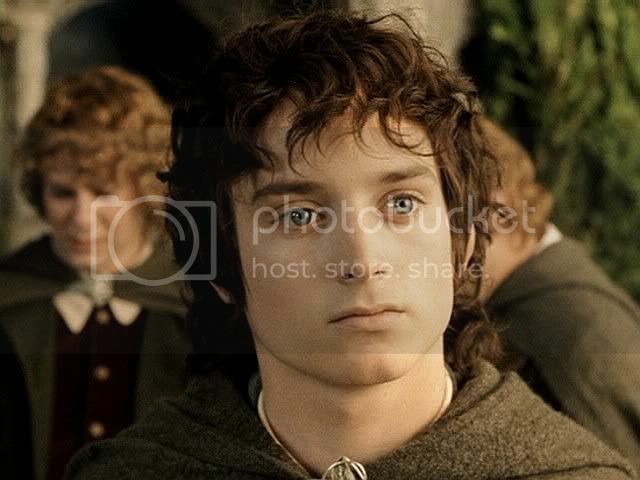 The poem offers a visionary sort of retrospective: as if Frodo, having finished the Red Book is looking back, just free-associating, watching images from his life pass before him like leaves upon the surface of the Brandywine. 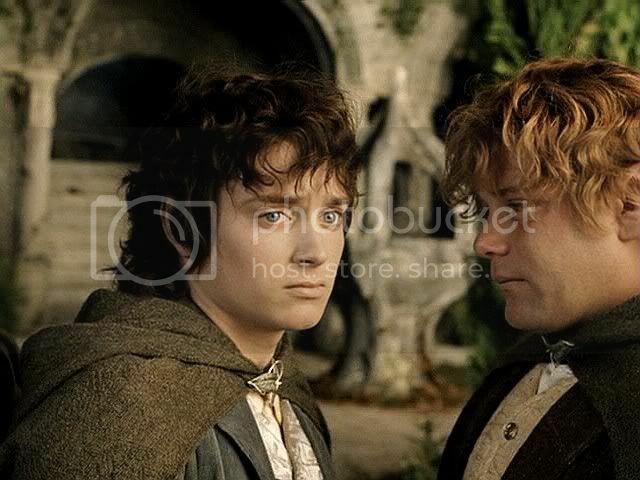 Leaves that are little vignettes, carefully selected from his childhood, growing-up years, the coming to him of the Ring, and significant portions of the Quest. For illustrations, I thought the very end of the poem was set off well by the handful of caps remaining from the Grey Havens scene. The sequence below comes right after Frodo has embraced Sam and given his kiss of blessing. The score shifts from the poignant farewell music (sustained strings over the Shire theme) to what I think of as the “Sea Music”: oboes like gull cries and mournful sailor’s pipes play spare little signatures above lower, slowly rocking chords (open fourths? ), droning in the choral voices, moving back and forth like the water under the boat rocking gently at anchor. 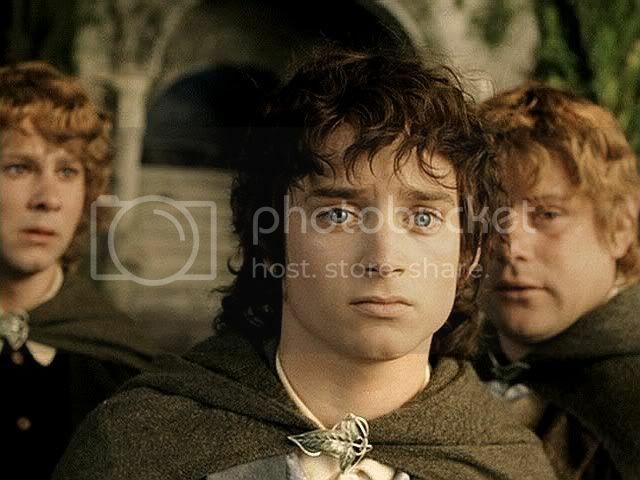 It is just as Frodo turns that the music shifts, subliminally signaling the turning of Frodo’s focus from his friends and home to the Sea. He turns from Sam, and, as he advances towards the ship, drawing closer and closer to the camera, the Sea Music calling more and more strongly, his face becomes subtly transformed, as if he can hear in the gulls’ cries and the sea’s lisp against the quay the whispering of the West. As he moves, in the slight slow-motion the filmmakers chose, he seems to float, rising and falling as he moves toward the gang plank, as if he were already on the Sea. That turn away from Sam towards the Sea, accompanied by the shift from the Shire theme to the Sea Music raises gooseflesh under my hair and down my back every time. 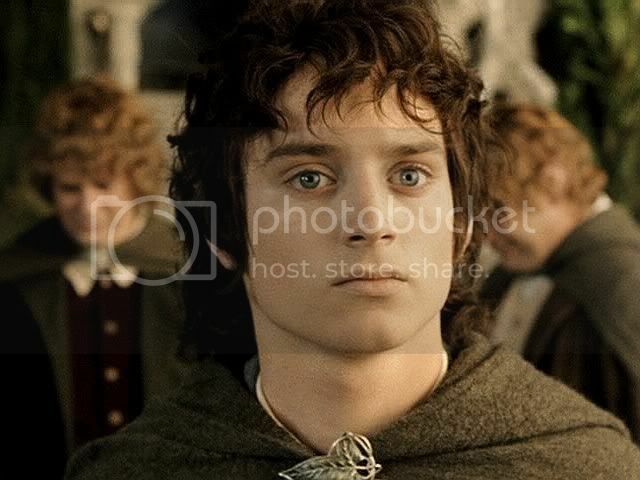 In a way, for me it’s the preparation for the burst of tears that comes when Frodo boards the boat and smiles his smile. The Sea Music draws from me a response of such depth and power, it, perhaps even more than the visuals, persuades me of the inevitably of Frodo’s sailing. How could he resist such a call? I could not. to themselves in its dawn. beneath a Sun bound for Winter. turning to meet the Storm. within the fields of Home. Voices upon the throat of the night…. the throat of the night. sends me to dreams of dread and desire. in a stilled current of Time. I see a circle of the great and small. standing open to the lemon moon. dealt out within chill caverns of stone. take this evil from me. drawn from shores made distant by time…. and feel her lips in blessing upon my brow. folds it against the tight beat of my heart. I see the mighty river of Kings. Fear in the face of my King. How dark it is upon this shore. which might never have known Light. Here, I can not see. within the realms of the living. him in fire and despair. Sam is helping me stand. as soon we shall be. nor why these strange clothes cover me. I do not remember why I should struggle more…..
My heart beats in my ears. that led me to this place. not that I am hungry, mind you. I should just have liked to have seen them. and the fields, pearl'd with barley. I should have liked to have seen them, too. and fall to silence in the depths of winter. The Shire has never seen such children. in the green-gilt call of the river…. Previous entry (“Frodo Waits for Sam Across the Sea” ~ Anduin caps, jan-u-wine’s “Soon” ) HERE. Thank you so much for the last several posts of screencaps and your insightful commentary--I've really enjoyed them all! You are welcome, Sam Star! OMG! That's the most sad and touching part of the book. I must always cry when I read it and also when I see these pictures or hear the music of the film. And now you shared this poem with us! I read it this morning before I went to work, which was wrong as I know now. It's adorable but it's also incredibly touching and sad! Thank you so much for sharing these lines with us, dear! I don't know what else to write now. I'm just too touched. Oh, Aredhelebenesse, I'm so glad you got to see the caps and read the poem. I was afraid few would read it. Because of the way Jan-u-wine formats her poems (which is integral to the way they scan), althought they really don't have that many words, they look really long. And, to read them with appreciation, they do take a little time, since pauses and breaths are so important to the way they "read". I think it's a touching poem, too. The first time I read it, for some reason I was quite unprepared for the end, when, after following the Shire to the river, Frodo sees "her". Who is "her"? I remember wondering for the split second it took me to read, "the Sea." Whaaaaaah! Yes, the end was amazing, wasn't it? This poem is perfect with all the breaks and the single words. 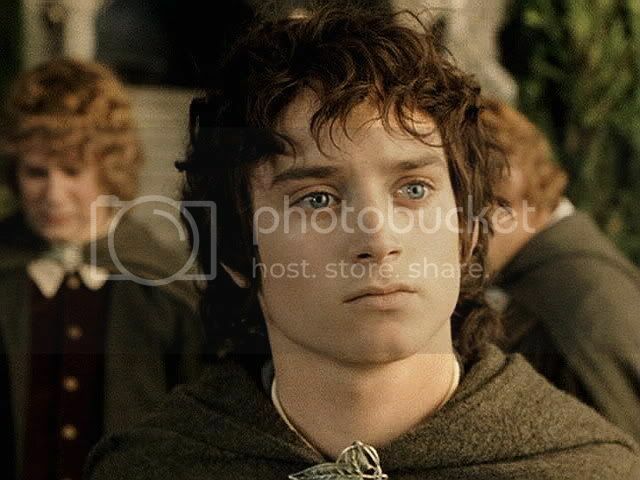 It's right what gives the special mood in it, what makes it so touching and let us see Frodo's confusion. His thoughts and his longing for his home and all the little things he learned to love after he came back home and he survived this quest. But most of all his longing for her! Poor sad Hobbit! Thank you, Mews. You are generous in your comments. I do think the music for Lord of the Rings was not only superb as music, but the most impressive scoring I've ever seen (heard?). I thought it was just good fortune that the music fit the scenes so well, but in the music portion of the Extras - for The Two Towers, I believe -- there was footage and interview with Shore and Jackson. Not in every scene, but in important ones, they worked together to fine-tune the scoring so that it supported a scene almost from one expression to the next. 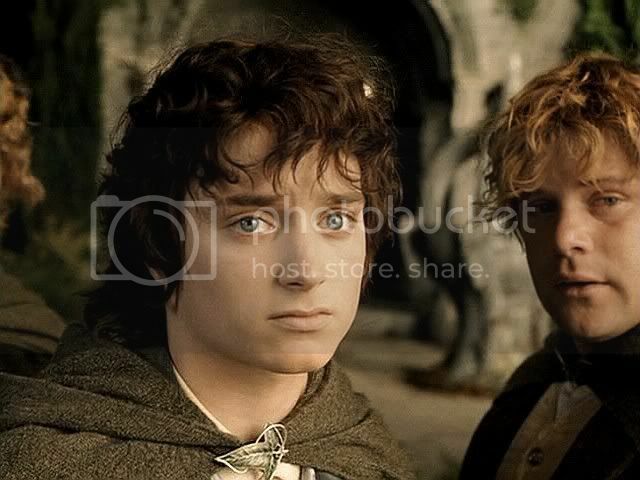 The example they showed was PJ and Howard going through the reaction shots of Frodo and Gollum to Sam doing his "U.N. Speech" at the end in Osgiliath. Pete talked Howard through what he wanted in terms of shifts in tone, since he's not a musician; what he wanted emphasized, what he wanted tone-done -- it was amazing to me to think what went into the scoring of these films. I don't know if the scoring work will ever be equalled. I doubt that Shore will ever do finer work, since he is unlikely to ever work on a similarly juicy and challenging project. One of my big pleasures during all of this was to see him conduct the LotR Symphony in Pittsburgh. It was an excellent performance. I was worried I would be disappointed. I wasn't. We were very close, in the fifth row. He was wonderful to watch. That ending always makes me cry. No matter how many times I see it. That was really lovely. 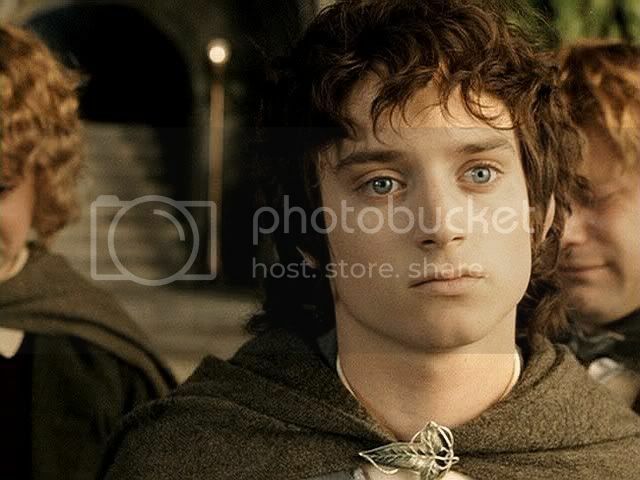 Both the poem and the caps of Frodo. I am in awe. Wow, I'm so glad you got your computer back! Your pic is framed and on my wall, you know. It's so BEEEEEYOOOTIFUL! I love this essay of yours Mechtild - both moving and informative. I enjoy reading about music, not only listening to it. I have never noticed the slight slow motion sequence before. Even without watching that scene anew I know exactly what you mean. It goes without saying that I love the screen-caps. Jan-u-wine's poetry - WOW! It pulsates - it has a life of its own. It is so beautiful. I read it through at a slow pace, absorbed it as it absorbed me, enjoyed it immensely. I felt as if I was drowning and my favourite book was flashing before my eyes. I can hardly wait until I can read it again. It is difficult to pick out favourite verses because the whole piece is brilliant. This gave me a sense of great fear. I love the images this conjures up. And the last verse - sigh! 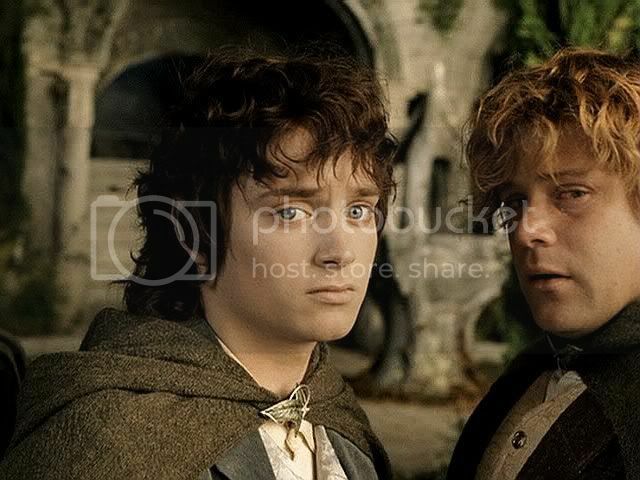 What I like about Frodo's expression as he walks away is that he looks almost mesmerized. It's like he's a spirit, being pulled to another sure.